The Lower Ouseburn Valley is a melting pot of creative activity among the business, residential and visiting communities. As a creative cluster, the Ouseburn Valley is a destination for people passionate about the arts as practitioners and supporters. This unique location provides a break from the bustle of the nearby city centre, blending creative industry, rich heritage and green space. Also close to a large residential area, the Lower Ouseburn Valley offers a space in which to live, work, play and learn for all ages and interests. For the past 15 years regeneration activity has taken place within the Valley in an effort to continue development and address social issues. 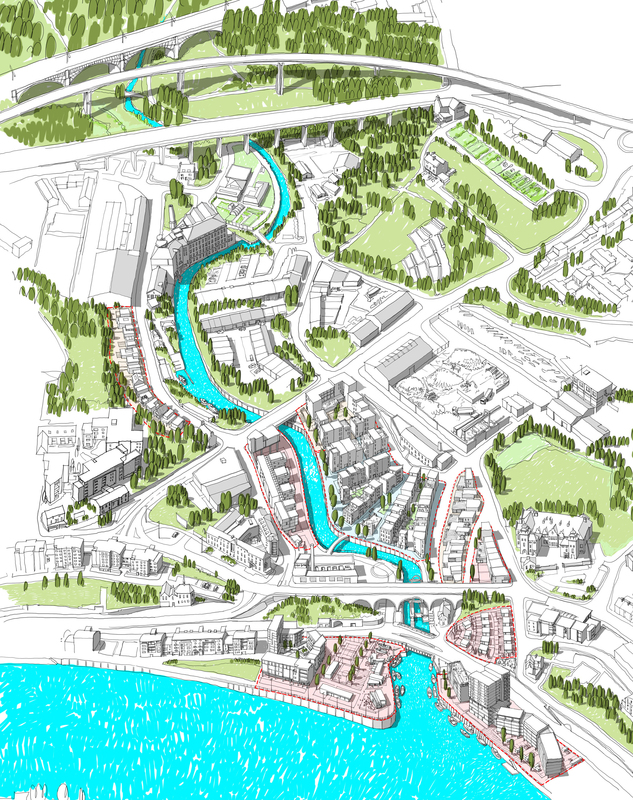 In line with the Lower Ouseburn Regeneration Strategy and the Lower Ouseburn Valley Consevation Area Character Statement, our aim is to aid the growth of an urban village that has evolved over time. There are three sites in particular that we will be looking at: Lower Steenbergs Yard, Spillers Quay and Malmo Quay. These sites shouldn' be considered on their own so want to work with local stakeholders to develop an overall vision for the Lower Ouseburn Valley thinking about the scale and type of development, the uses, the design and the feel and look of the place. This is what we hope to be exploring through the consultation exercise. If you want more information about consultation events in the Valley and to keep up to date with progress please join our mailing list. Also check out the LOVE Blog Newcastle for more information. If you couldn't make it this weekend we have uploaded the boards (just to the right) so please take a look and tell us what your think. We will be launching an online forum to gather comments on the emerging schemes in around a month. For now there are a number of ways of contacting us. You can email comments to: ouseburn@urbed.coop or use our freepost address: FREEPOST, URBED, 5th Floor, 10 Little Lever Street, M1 1HR or call Emily on 0161 200 5500. Specifically - what do you think of our sketch ideas for Malmo Quay? We’d love to know before we start developing ideas with our architects so your comments inform the developing designs. This will be the third consultation event for the Lower Ouseburn Valley Exchange and it will be in the form of a workshop. We will be updating you on the changes we have made to the proposals after the first two consultation events. We will then be asking you to assess each scheme against the Building for Life Criteria. This is a list of 12 questions which are scored on a traffic light system. The more greens a development gets the better the development will be. A red light will give a warning that an aspect of the development needs to be reconsidered. You can find out more about the assessment criteria in this document: Building for Life 12. We really value your feedback and encourage you to continue to have your say. If you are interested in the progress of the Lower Ouseburn Valley Exchange and what people have been saying thus far please check out the LOVE Consultation Update August 2013 to the right of this page. We are planning a third consultation event in the form of a workshop and hope you can make it. WHAT: A roundtable workshop discussing current proposals for 3 sites in the Valley. Everyone is welcome but please email ouseburn@urbed.com or call Emily on 0161 200 5500 to let us know that you plan to attend. See you there! The proposals will be discussed in a workshop. This workshop will provide an opportunity for a wider discussion about people’s desires for the Lower Ouseburn Valley and how it should be developed. This will be help influence a more detailed set of proposals over the summer and lead to further workshops in September. +44 (0)7714 979 956 if you wish to attend. The Lower Ouseburn Valley Exchange kicks off with an Airstream exhibition at the Ouseburn Festival on 6th & 7th July. Come and view the exhibition of initial ideas for the Lower Valley and our outline proposals for the three main sites. Check out the LOVE Blog Newcastle for more information or download our July 2013 LOVE Newsletter to the right. If you would like to have your say about the proposals please take a look at the consultation material on the right and fill out this online questionnaire.